More than 16,000 participants took to the streets in Rogers, Arkansas for the 13th annual Susan G. Komen Ozark Race for the Cure. 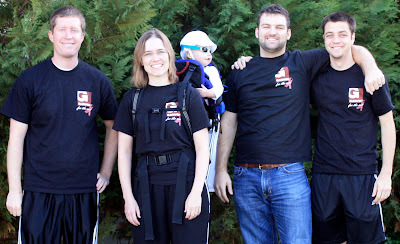 Garver employees Nathan and Natalie Becknell, (along with their daughter), Brandon Bynum, and Adam White participated in the race. Sporting Garver-designed team t-shirts, Nathan, Brandon, and Adam ran in the competitive 5k race. Natalie and her daughter joined the 1k family fun walk, and the Becknell baby also showed her support in the Crawl for the Cure.